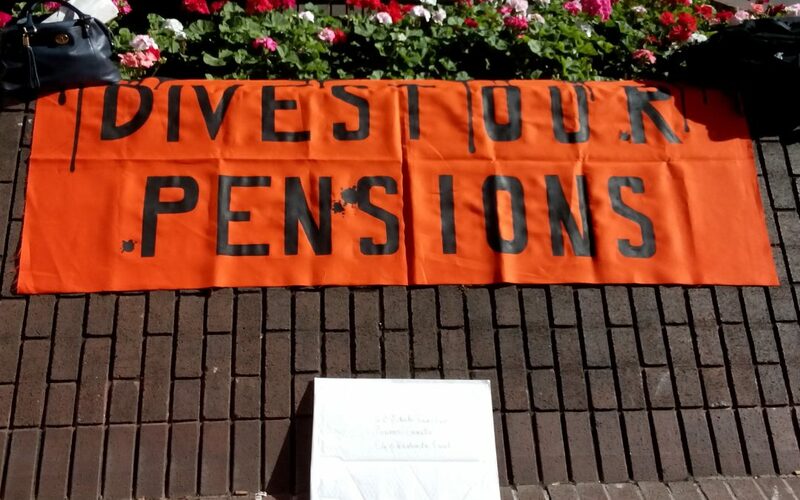 If you haven’t heard of Divest WMPF, we are campaigning for divestment action here in our region by asking the West Midlands Pension Fund to freeze their investments in fossil fuels and reinvest the money in renewable energy. It’s a big task, but we are incredibly passionate about divestment as a climate action. With massive environmental and economic benefits we see it as one of the best ways for the West Midlands to reduce it’s carbon footprint and have a real and positive impact on our future. After all, the pension fund in its essence is a fund for future security. For the WMPF to have billions of pounds invested in economically unstable and environmentally immoral oil and gas companies seems counter-intuitive and down right wrong. Campaigning over the past six months has had it’s highs and lows. Response to our public engagement has been fantastic which is encouraging when other areas of the campaign aren’t progressing as swiftly as we would like. On a chilly afternoon in February we held our first action in Victoria Square featuring giant bubbles (very popular with the Birmingham shoppers) and our very own divestment rap. We gathered well over a hundred signatures and had some great conversations with passers by. Since then our petition has continued to flourish and we have even gained a few new team members as a result. Positive feedback from the public is rewarding and inspiring. With a lot of work to be done behind the scenes in order to actually get the Pension Fund to hear our voice, an ever growing list of petition signatures really keeps us motivated. It is an exciting time for the Divest WMPF campaign with lots of plans finally coming into motion. There is plenty to do and we are always looking for helping hands, so we encourage anyone with an interest in the global climate movement and their local environment to join us. Divestment is an incredibly promising climate movement that is sweeping the globe with an ever-growing success list. We are determined to see that the West Midlands Pension Fund is one of the next UK authorities to ditch the dirty oil companies and invest in a clean, just and sustainable future!